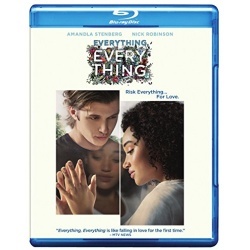 Everything, Everything is a movie for teens, released on Blu-ray Disc by Warner Home Video on August 15th, 2017. This romantic drama film was written by J. Mills Goodloe, based on the young-adult novel by Nicola Yoon. The story follows a teen named Madeline, who has lived isolated from the world due to an immuno-deficiency disease. When new neighbors arrive, Maddy must make some choices involving the risk of leaving the safety of her cocoon. Eighteen-year-old Maddy was diagnosed long ago by her mother Dr Pauline Whittier with an immuno-deficiency disease known as SCID. This prevents her from leaving her home, and Pauline takes care of her with the help of her nurse Carla. Only Pauline, Carla, and Carla’s daughter Rosa are allowed to enter the house, keeping Maddy safely sealed off from the outside world. While Maddy yearns to see the world, she has become somewhat resigned to her fate. Soon a new family moves next door, and their son Olly catches her attention. Later that night Olly and his sister ring the doorbell, offering the Whittiers a bundt cake. Olly and Maddy begin a relationship through texting and email, with the occasional sightings through their adjacent windows. As Maddy becomes more and more attached to Olly, she has to decide whether she should keep obeying the rules, or risk it all to see the outside world with Olly. Everything, Everything is actually a pretty decent addition to the young adult / teen romance genre. With a grounding based on a mother’s concern for her vulnerable child, the film delivers a solid story with relatable characters. In a world where teen and young adult literature was dominated by the likes of Twilight, this film has a welcomed tie back to reality. For the most part the story and characters come across as natural and true, and while it is a little procedural, there is the occasional surprise. Every now and then the film goes into Maddy’s ‘imagination land’, which offers a more whimsical tone and gives the characters a better chance to interact. While not especially fond of the genre myself, I think that Everything, Everything delivers well on its promises and is a good choice for the teen and young adult audience. The largely unknown cast features Amandla Stenberg, Nick Robinson, Robert Lawrenson, Danube Hermosillo, Taylor Hickson, Sage Brocklebank, Peter Benson and Dan Payne. Everything, Everything was directed by Stella Meghie, who previously directed Jean of the Joneses. Reviews for the movie were mixed, with a Rotten Tomatoes score of 45%. It did better with the public though, earning an IMDb score of 6.3/10. Everything, Everything was a financial success in the cinema, taking in $34.1M at the US box office and a further $20M overseas, against a budget of only $10M. The video on the disc is an AVC 1080p encode at 34 Mbps, and is presented at 1.78:1 aspect ratio, filling the HDTV screen. For the most part the cinematography is fairly pedestrian, though there are moments of departure in the dream sequences. The images are nonetheless crisp and clean throughout with this high bitrate Blu-ray transfer. For full resolution PNG screen captures taken directly from the disc, check out the details page for Everything, Everything. The disc is a dual layer BD50, with 33.7 GB used and is coded for All Regions. Despite the low budget, Warner has included a couple of supplemental features, along with additional formats. A short making of featurette where the cast and creators talk about the movie. Both director and the original novel author talk about their inspirations for the story and the film. A fairly extensive collection of deleted scenes that were no doubt cut for pacing. We get some additional insights here, mostly Maddy’s interactions with supporting characters. This release includes a DVD Copy for legacy players and an UltraViolet Digital Copy code. Everything, Everything is a pretty strong contender for the young adult audience. This Blu-ray release from Warner Home Video features a solid transfer and even includes a couple of supplemental features. The retail price is $35.99, though you can get it at Amazon for $22.91, saving 36%! A 17 year old girl named Madeline Whittier has a rare disease that causes her to have to stay indoors 24/7 with her filtered air. Her whole life is basically books, her mom, and Carla (her nurse). One day, a moving truck pulls in next door. There she sees Olly. Olly Bright is Maddy’s new neighbor. They get to know each other through emails. The more they get to know each other, the more they fall in love. Olly starts to make Maddy realize that she isn’t really living. This starts the adventures of Maddy’s new life. This entry was posted on Monday, August 28th, 2017 at 4:24 pm	and is filed under Blu-ray, Commentary, Drama, Romance, Warner. You can follow any responses to this entry through the RSS 2.0 feed. You can skip to the end and leave a response. Pinging is currently not allowed.